Click the image above view or download the article. Orchids of War by Denise Frisino is an intriguing historical novel that instantly takes readers back to World War II. A time when Japan attacked Pearl Harbor. The attack was completely unseen. This caused a great a fear and an intense dislike towards the Japanese Americans. A young woman struggles with her growing interest with the Japanese culture while her father doesn’t like it. Denise Frisino has beautifully captured the love and respect of some Japanese and the hostility towards others. Families split and others are united. The difficulty to embrace a culture that has suddenly attacked one’s country leaves a foul taste in one’s mouth. However, the story takes on a journey that every reader will enjoy. Trial, betrayal, and love are all a huge part of this historical novel. Orchids of War shows both the beauty and the ugliness of the war. World War II has just begun and so many changes have occurred for one family. The fear and bravery of the sons and fathers who served in the military during this time are shown great honor in this read. I love anything that depicts a realistic viewing of the World War II time period and Orchids of War does just that. Denise Frisino is a talented writer. Her story will keep readers on the edge of their seats as they wait for what happens next. Overall, I highly enjoyed reading this new title and look forward to reading the next book by Denise Frisino in the future. I highly recommend this novel to readers everywhere. I normally read when I travel since the flights can be quite long. I picked up Orchids of War to help pass time on a 7 hour red eye. Figured it would help me sleep once the plane steadied out. Boy was I wrong. Once you start this book you have a real hard time putting it down. What a great read. It is one of those books that you put on the read again list because it is so enjoyable. Orchids of War is a historical fiction novel by Denise Frisino. It revolves around the O’Shaughnessy family that is caught up by the events of 1941 in the United States, which is about to officially get involved in World War II by declaring war on Japan after the attack on Pearl Harbor. Billi O’Shaughnessy could not have imagined where her fascination with the Japanese culture would lead her. Her trip to Japan thwarted, she got engaged and continued her friendship with the Nakamura family. When FBI agent Jack Huntington comes to visit her at home, her life will take a bizarre turn and she will find herself involved with the war itself. Meanwhile, her fiancé is killed while doing aviation training and her brother is drafted into the army and sent to Hawaii. 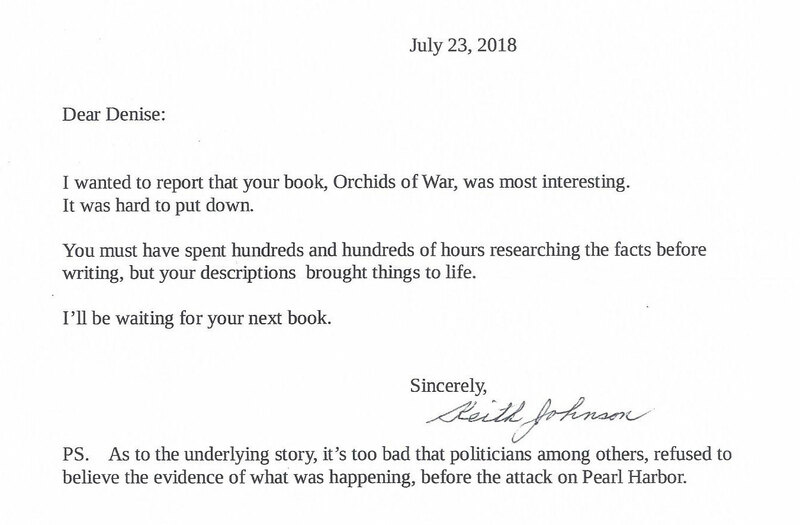 Orchids of War is not your usual historical fiction novel set in World War II. History tells us that many Japanese living in the United States were herded into prisoner of war camps during this tumultuous time. Author Denise Frisino takes her cue from this historical event to construct the story of the O’Shaughnessy family. The result is a fascinating book that is as interesting as it is informative. It takes us back to a time when the impending war pervades the air and engulfs the homes of every American. For Americans of Japanese descent, torn between their loyalty to their homeland and adopted country, it was a time of reckoning. And for Billi, her love for everything Japanese is now used against a culture she has come to admire.